Over the last seven years, software startup investing has changed quite a bit. In 2010, classic SaaS was booming, the benefits of a subscription model were finally becoming clear to the public markets and the mass-market. Since then, many other types of software businesses have been created in new categories like agriculture technology and robotics. Which of these markets are growing the fastest for investment dollars? 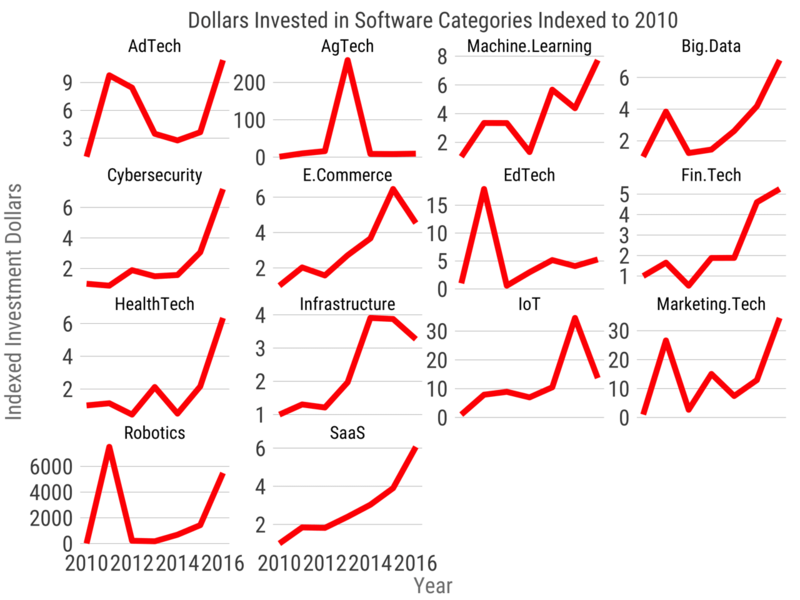 The chart above breaks out 14 different software categories and shows the amount of dollars invested in each category indexed to 2010 levels. In other words, if machine learning startups raised the same amount of money in 2016 is 2010, the chart would show a value of 1. If those startups raised twice the amount of capital then the figure would be 2. Advertising technology has seen a resurgence in 2016, reversing a three year trend of declines. Agricultural Technology (AgTech) boomed in 2013, but has not recovered after substantial drop from its one-year high. Machine learning startups continue to raise ever more capital, as do big data companies. Cybersecurity investments are classic hockey stick. E-commerce companies may have fallen from their 2015 highs but are still raising four times as much capital as they were in 2010. A bit of shine may have come off Internet of things companies, while investors continue to pour money into marketing technologies despite the explosive growth in the number of competitors. The fastest growing relative to 2010 is robotics and drones who have witnessed 6000X growth relative to 2010 when there was effectively no investment. Classic SaaS investment relative to 2010 continues to grow, with now more than six times the dollars. However, the story is different if we look at round counts. Aside from machine learning and robotics, every single category of software investment has fallen in the number of rounds relative to their highs in 2015. There are fewer software startups raising capital in 2016 than 2015. We noticed this trend halfway through 2016 and the second half of 2016 did not Turn the trend around. 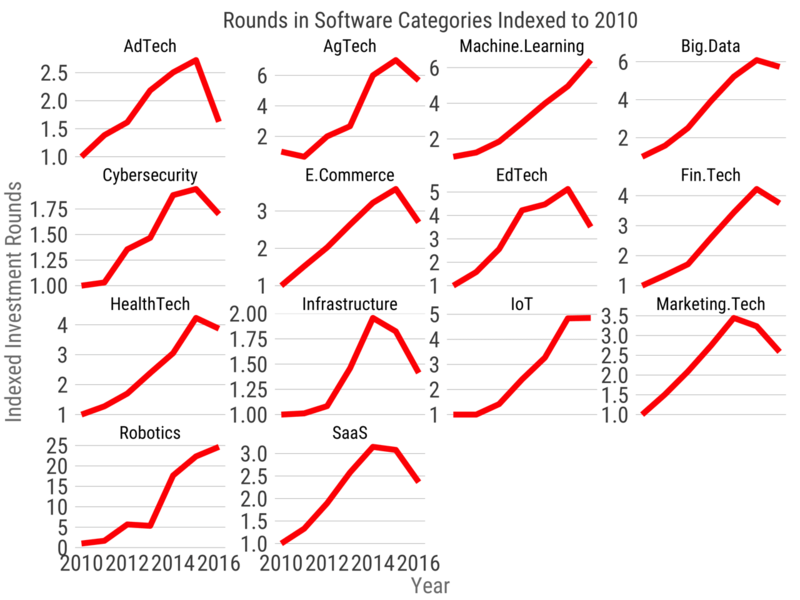 Still, relative to six years ago, most categories of software are still at least 50% higher in round counts, even if they are coming of their highs. This is an interesting trend because venture capitalists raised roughly equivalent amounts of money in 2014, 2015 and 2016. Despite this increasing amount of capital on investor’s balance sheet, 2016 was a slower year by round count. And this data implies that fewer earlier stage companies raised, which means there will be fewer Series Bs in 2017 and fewer Series Cs in 2018. With lots of capital in hand, and fewer companies in the pipeline, the data suggests we will see increasing valuations in the next few years or a move up market, as VCs search for places to invest the large funds raised in the past three years.